Apple has introduced a new plug connection with the iPhone 5, which is no longer compatible with the adidas miCoach heart rate sensor for iPhone/iPod touch. 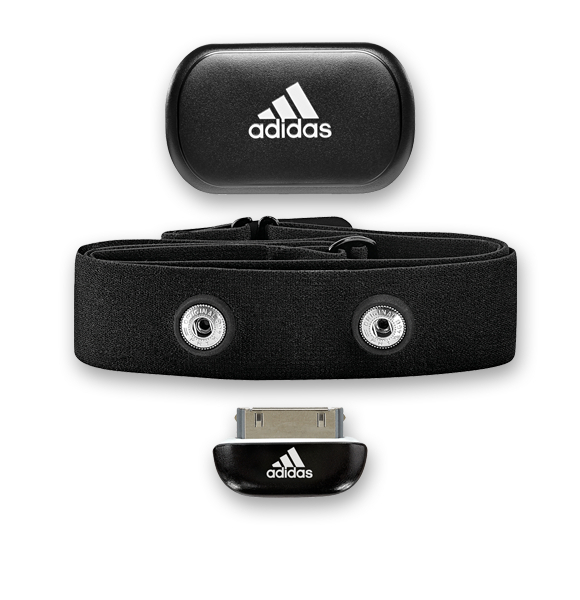 The adidas heart rate sensor set for iPhone/iPod touch includes a textile chest strap, a heart rate transmitter, and the miCoach CONNECT adapter. This transmits your pulse data from the adidas miCoach heart rate sensor for iPhone/iPod touch to the iPhone. Using freely available adidas miCoach Apps, you can analyse your workout on site or control whether you are in the optimal heart rate zone while exercising. The adidas miCoach heart rate sensor for iPhone/iPod touch transmits digitally with a frequency of 2.4 Ghz. This ANT+ transmission protocol works interference-free. As each adidas miCoach heart rate sensor for iPhone/iPod touch is assigned to a receiver/dongle, you can even exercise in bigger groups without receiving the data of your training partner by accident. Therefore, the adidas miCoach heart rate sensor for iPhone/iPod touch is also excellent for training of team sports. This is especially ideal in combination with the new motion sensor adidas miCoach SPEED_CELL, which offers a very precise motion protocol for later analysis.